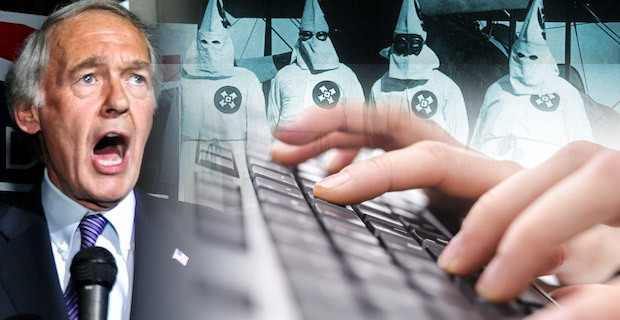 Sen. Markey and the Democrats want you to believe there are evil KKK racists out there blogging and they threaten the social order. Earlier this month, we ran a story on Senator Ed Markey’s The Hate Crime Reporting Act of 2014. The legislation proposes updating a twenty year old report on the role the internet, radio and TV allegedly play “in encouraging hate crimes based on gender, race, religion, ethnicity, or sexual orientation.” The report would then be submitted to respective committees in the House and Senate for action. Mac Slavo, writing for SHTFplan.com, extrapolates how the government might go about collecting “hate speech” on the internet to be included in the report and then submitted to Congress for action. This is the real nature of The Hate Crime Reporting Act of 2014. It is not designed to prevent crimes by racists and homophobes. It is designed to shut down speech. It is designed to eliminate the political opposition. The establishment does not care about the murder of gays or lynchings of blacks, as infrequent as such events are in today’s world. The political establishment, be it controlled by Mao, Stalin, or Obama, is primarily and exclusively interested in safeguarding and maintaining its monopoly on political power. Imposing a “hate speech” criteria is merely another way for the establishment to make sure there is no challenge to its hegemonic power.